The Enforcement Directorate (ED) today registered a money laundering case against former Maharashtra Chief Minister Ashok Chavan and 13 others in the Adarsh Housing Society scam. Nupur Talwar was today jailed after a special CBI court rejected her bail application in the case of murder of her 14-year-old daughter Aarushi and domestic help Hemraj in Noida four years ago. A decision on her interim bail application has been reserved for tomorrow. The governments of Himachal Pradesh and Uttarakhand got a shot in the arm today with the Parliamentary Committee on Commerce and Industry recommending the extension of special category status to both states. The special status to both states ends in June. India and Japan today decided to move ahead with their negotiations to wrap up a civil nuclear accord and launched dialogues on maritime and cyber security. In a clear move to break the Chinese monopoly, India and Japan today agreed to cooperate in the field of rare earths, which are used in high-tech products. Flaying the opposition for not cooperating on the Lokpal Bill, Law Minister Salman Khurshid has said the government was committed to bring a strong anti-corruption legislation. Congress general secretary Rahul Gandhi was in for a surprise as party workers today minced no words and did some straight talking, giving him their honest opinion about leaders who let the party down during the recently concluded Assembly elections. A five-member group of techies has been arrested for duping scores of unsuspecting customers across the country of nearly Rs 5 crore by skimming and cloning credit and debit cards using sophisticated electronic equipment. Hinting at positive movement on India-Pakistan issues, Indian Defence Minister AK Antony and Home Minister P Chidambaram, in separate developments today, expressed confidence that issues between the two nations would be resolved. The Civil Aviation Ministry has agreed to sanction Rs 2 lakh crore for expansion and modernisation of the Netaji Subhas Chandra Bose International Airport in Kolkata. China and Pakistan, who are defence allies and also partners in the joint development of the fighter aircraft ‘JF-17 Thunder’ for their respective air forces, have now decided to add more teeth to their warplane by inducting newer engines. They have also gone in for a strategic switch that will keep India on its toes. The Supreme Court was highly critical of the Italian government today for buying the silence of two fishermen’s families of Kerala by paying them Rs 1 crore each in utter disregard for the Indian legal system. Two Air India flights with 254 passengers on board made emergency landings at Kozhikode and Chennai airports after suffering a bird-hit and oil leakage, airport sources said. The Ministry of Home Affairs is working on a consolidated information technology (IT) road map for the Central Armed Police Force (CAPFs). Besides exploiting the use of IT for management and inter-service data sharing, the network will overcome several deficiencies that exist in the existing independent networks. The stalemate over ‘dubious’ voters in the Meghalaya electoral roll continues. After the talks with the Meghalaya Government failed to break the deadlock, NGOs have decided to intensify their agitation. Enforcement Directorate counsel RV Desai told the Bombay High Court that the agency had on March 5 filed an Enforcement Case Information Report (ECIR) against 14 persons named in the Central Bureau of Investigation's FIR. According to the ECIR, the accused committed an offense under the Prevention of Money Laundering Act (PMLA) by illegally obtaining permissions to construct the Adarsh Housing Society and acquiring flats far below their market value. The High Court took the ED to task for the way it had dealt with the case. Judges SA Bobade and Mridula Bhatkar, who are hearing the PIL petition on the Adarsh scam, asked the agency when it would register a FIR in the case and arrest the accused. "Last December, the court had asked the ED to make a statement on applicability on provisions of the Prevention of Money Laundering Act. But even today the agency is not able to make a conclusive statement on PMLA," Justice Bobade said. The Enforcement Directorate's counsel replied that the agency was waiting for the CBI to file its chargesheet in the case. The ED also sought time to probe whether the accused had purchased flats in the society using funds from proceeds of crime. The CBI has submitted to the court that it would complete the probe by June 15 and submit its report after that date. The ED had earlier issued summons to the members of the Society, directing them to furnish information regarding purchase of flats in the 31-storey housing society in south Mumbai and mode of payment. Those arrested include Society secretary RC Thakur, Brigadier MM Wanchoo (retd), former Congress MLC Kanhaiyalal Gidwani and Pradeep Vyas, former Mumbai Collector. The CBI, which registered a case last January against 14 people, has so far arrested nine persons including IAS officers Jairaj Phatak and Ramanand Tiwari, Major Generals (retd) AR Kumar and TK Kaul and PV Deshmukh, a former deputy secretary in the Urban Department. The remaining five accused are Chavan, former Principal Secretary to the Chief Minister Subhash Lala, Col TK Sinha (retd), Brigadier PK Rampal (retd) and Deputy GOC RC Sharma (retd). Earlier in the day, dentist Nupur surrendered before the Ghaziabad CBI special judge court. She was taken into judicial custody. The Court has been hearing the double murder case of Aarushi and domestic help Hemraj. 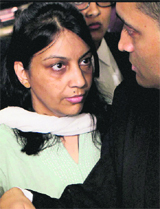 Nupur and her husband Rajesh Talwar reached court at around 10.15 a.m. She was taken into the court from a back door. Her lawyers had applied for bail on the grounds that she is a woman and is, therefore, deserved leniency. They also pointed out that Rajesh has already been granted bail and so Nupur should be treated at par. They further stressed that the trauma of losing her young child will be exacerbated if she was sent to jail. CBI opposed Nupur's bail, describing the crime that she is accused of as "heinous." Nupur was taken from court to Dasna Jail in the evening. Jail officer said after her medical examination she will be kept at Barrack No.13 which is reserved for women prisoners. An upset Nupur was seen weeping on the shoulder of one of her relatives. Her 14-year-old daughter Aarushi was found dead at her bedroom at Jalyayu Vihar Noida apartment on May 16, 2008. Her throat was found slit. Initially, it was suspected that the domestic help Hemraj may have killed her. A day later, Hemraj’s body was also recovered from the terrace. The committee also recommended that the special category status be also granted to Bihar, Odisha and Jharkhand “so that these industrially backward regions are able to avail the benefits of the centrally sponsored scheme”. The department-related Parliamentary Committee on Commerce and Industry made these recommendations to the government in its report pertaining to the Demands for Grants (budgetary allocations) of the Department of Industrial Policy and Promotion which runs the special category status scheme of the ministry. Special category states which enjoy the central package include Jammu and Kashmir, Himachal and Uttarakhand. This centrally sponsored scheme involves implementation of various components of the industrial incentive package notified for these three special states. The package for J&K (which remains undisturbed) includes extending financial assistance towards Central Capital Investment Subsidy, Central Interest Subsidy and Central Comprehensive Insurance Scheme. J&K Development Finance Corporation is the nodal agency for routing of incentives and subsidies provided under the special status category to the eligible industrial units. However, for Himachal Pradesh and Uttarakhand, only one component of the package is applicable - the Central Capital Investment Subsidy Scheme. The scheme enables eligible industrial units to claim significant fiscal sops under the scheme for which the Himachal Pradesh State Industrial Development Corporation is the nodal agency. In Uttarakhand, the nodal agency is State Infrastructure and Industrial Development Corporation. Punjab had earlier opposed the extension of special status to Himachal. Meanwhile, the committee report highlights how the budgetary allocation under this centrally sponsored scheme has reduced. 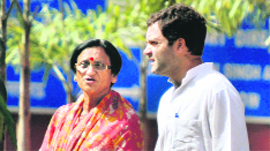 It was Rs 200 crore for fiscal year 2011-12 and Rs 90 crore is proposed for 2012-13. “We (have) confirmed that we will move ahead with negotiations to arrive at a mutually agreed settlement on civil nuclear energy cooperation. At the same time, I asked for understanding on Japan’s strong desire for nuclear disarmament and non-proliferation,’’ Japanese Foreign Minister Koichiro Gemba said at a joint press interaction with External Affairs Minister S M Krishna after the two ministers co-chaired the sixth India-Japan strategic dialogue and the first ministerial level economic dialogue here. The two nations would continue to understand each other’s perceptions and have instructed their negotiators on the way forward, Krishna added. In other steps to strengthen the bilateral strategic partnership, the two countries decided to kick-start maritime and cyber security dialogues and hold joint naval exercises off the coast of Japan in June. The naval exercises will be conducted by the Indian Navy and the Japan Maritime Self Defence Force. They also decided to move ahead with collaboration in the development of rare earths. The two countries committed themselves to concluding a bilateral social security agreement soon. Asked why Tokyo had decided to hold the maritime dialogue with India, Gemba said India was situated at a strategic location on sea lanes of communication between Japan and the Middle East. The proposed maritime dialogue would not only serve both countries but also help in maintaining peace and stability in the world. Referring to regional issues, the Japanese minister said he had also discussed the situation in Afghanistan, Myanmar and North Korea with Krishna. “After today’s discussions, I am convinced that we are close to the take-off stage in this important area of our bilateral cooperation,’’ External Affairs Minister S M Krishna said after talks with his Japanese counterpart Koichiro Gemba here. Rare earth materials are used in sensitive defence technology, computer hard wares, smart phones, cars and electronics. Japan routinely used to get rare earth materials from China. But sometime back, Beijing stopped shipments of these minerals to Japan, limiting Tokyo’s ability to make many of their own exports. This was an offshoot of a boating incident in disputed waters between China and Japan that soured relations between the two countries. China controls 95 per cent of the global market of rare earth material exports. India is one of the few countries believed to have the potential to develop these rare earth materials because it’s a manpower intensive industry. Japan had been discussing with New Delhi for the last one-and-a-half years on the possibility of importing these minerals from India in order to stop the disruption in production of their goods because of the Chinese action. The Indian government is said to be spending $ 32 million on a 5000 metric tonne capacity plant in Orissa to develop rare earths. India had stopped producing these materials in 2004 due to lack of market competitiveness. "The union government is ready to accept every good proposal and is committed to bring a strong Lokpal Bill for which the opposition parties need also to cooperate", the minister who was here on a day's visit to his parliamentary constituency yesterday said in reply to a question on Swami Ramdev's statement on black money. He said that besides the Lokpal Bill, government is also committed to bring eight bills for further strengthening the Indian Penal code, checking corruption in judiciary, curbing atrocities on women and bringing transparency in government purchases during the monsoon session of Parliament. For providing better health facilities in the state, the union government is vigilant towards providing a multi-speciality facility like the AIIMS, the minister said in reply to a question. While refusing to give a direct reply to questions on reports of his move to resign from the ministry and instead working for the party organisation, he said that all depends on the wishes of party president Sonia Gandhi. The usual attitude of handling the youth icon with kid-gloves was missing when Gandhi arrived on a three-day visit to his constituency, the first after the drubbing at the polls. His direct interaction with party workers of Tiloi Assembly segment at Ram Janki Bajpai Girls School at Semrauta was marked by embarrassingly honest feedback by party workers. They put the blame on senior leaders who according to them were milking the Congress party to their own benefit in New Delhi. The told their MP in no uncertain terms that these leaders had actually neglected the Congress party’s interests indirectly benefitting the SP and BSP during the polls. Gandhi assured that the entire party organisation from the booth level to state level would be reshuffled within the next three months. The gang that included two web designers and an MBA graduate lured customers by offering a ‘Make-A-Deal’ scheme, asking them to pay just Rs 50 through debit and credit cards to win big deals. The fraudsters splurged the ill-gotten money and lived life king size, driving Audis and Chevrolets, before the law caught up with them. The Hyderabad Police busted the gang that defrauded credit and debit card holders across the country and arrested five persons. It recovered electronic equipment, Audi and Chevrolet cars, and Rs 5 lakh from them. Cyberabad Police Commissioner D Tirumala Rao said the scamsters had skimmed and cloned credit and debit cards using a complex modus operandi involving hacking, using international IP addresses, Internet hawala, spying and electronic data theft. The police recovered some sophisticated electronic equipment from them, including skimming machines, an ATM data skimming machine, ATM dome cameras, electronic magnetic writers, card printers and ATM pin pad skimmer machines. The gang even placed spy cameras at ATMs that picked up PINs of users. Such was the elaborate plan of the fraudsters that they had actually set up a laboratory at Motinagar in Hyderabad complete with sophisticated equipment worth over Rs 50 lakh, police official said. The arrested have been identified as P Kamal Kumar, a web designer from Hyderabad who was the kingpin of the racket, Ammar Ali of Tamil Nadu, Zameer Shaik, a web designer from Mumbai, Ajay Lal Mathur, a hotel waiter from Delhi, and S Jamal of Kishangunj, Bihar. The scamsters had taken help from one Kronik of Canada regarding collection of data of card-holders, the skimming and cloning process. They then imported the required equipment from him. The gang deposited the stolen cash in 22 accounts across the country. They then shifted operations to Ranchi where they floated a Petro Card Scheme offering concession for servicing, denting and painting of cars. More than 500 people fell for this and swiped their cards. Next they started targeting unmanned ATMs. They imported four Pin Pad Skimmer machines at a cost of Rs 3 lakh each from Alex Rosenberg in Russia. The targeted a Corporation Bank ATM in Delhi and skimmed data which was decrypted by the Russian, and then cloned on to plastic cards, using which they withdrew Rs 3 lakh in December. Antony said India and Pakistan have agreed to hold meaningful and result-oriented discussion to demilitarise the Siachen glacier region where 26 soldiers died during deployment last year. Both sides welcomed the ongoing dialogue process that was contributing to an enhanced understanding of each other's position, Antony said. Demilitarisation of the glacier, where India holds commanding heights, is one of the issues that has been raised repeatedly at Indo-Pak meetings. The glacier is a no-man’s-land that was occupied by India under operation ‘Meghdoot’ in 1984 after it suspected that the Pakistan army was sending a team to occupy it. Troops of both armies occupy posts between 16,000 ft and 22,000 ft high and its costs an estimated Rs 3 crore a day to maintain supplies and troops. Recently, Pakistan Army Chief Ashfaq Parvez Kayani had said that Siachen, the highest battlefield in the world where the two countries are engaged in an eyeball-to-eyeball confrontation, should be demilitarised. The Indian Defence Ministry has not taken any stand on the issue so far, but has made it clear that it would want guarantees from Pakistan that it would not engage in any adventures if the glacier is demilitarised. Later in the day, Home Minister P Chidambaram said he was hopeful that the liberalised visa regime between India and Pakistan could be signed when the Home Secretaries of the two countries meet. The two Home Secretaries are expected to meet in the last week of May. “We can talk of trade and have confidence-building measures along the LoC,” the Home Minister said. The ministry also approved the state’s proposal for introducing inter-land helicopter services from Kolkata to different districts. Civil Aviation Minister Ajit Singh conveyed these decisions at a joint press conference with Chief Minister Mamata Banerjee after their meeting at the Writers’ Buildings today. Singh said Kolkata airport would be upgraded on par with other international airports in Delhi, Chennai and Bangaluru. “Our target is to increase the passenger handling capacity of the Kolkata airport to 8,000 million from the present 4,000 million soon,” he added. Singh said some problems arose in setting up the airport at Andal following objections from the coal ministry. But the matters would be sorted out soon at the ministerial-level discussions. "Kolkata airport is not only the gateway of eastern and north-eastern India but also the entire South-East Asia. Developed air connectivity here will help promote development as well as tourism, besides creating opportunities for employment", Singh said. Stressing on the trade and tourism potential of the state, Singh hoped that the Airports Authority of India would be benefited by developed air-connectivity in the state. Singh said during the meeting with Mamata, they had also discussed some political matters, relating to the Presidential poll and future of the UPA government. Mamata said she was happy at the Centre’s decision of sanctioning Rs 2 lakh crore for the Kolkata airport. She hoped the expansion and modernisation of the airport would be taken up at a war footing and be completed within next two years. She was confident that the inter-land helicopter services could be started during the coming festival and puja months in September and October. Beijing and Islamabad are not banking on the supply of Russian jet engines for the JF-17, but have tapped an alternate source —Ukraine — which has similar technology as it was part of the erstwhile USSR. Indian security agencies have informed the government about this move and given a detailed assessment of what it means for India and why China-Pak have made this strategic switch towards Ukraine. The Russian media has reported during the past two months that Moscow has stopped supplies of the Klimov RD-93 engines to Beijing. The JF-17 was inducted in China and Pakistan in the past two years. Pakistan plans to get 250 JF-17 aircrafts in the next few years and is, at present, operating little over two squadrons — some 50 planes. The single-engined JF-17 is powered by the Russian engine Klimov RD-93, which is a variant of the RD-33 used on the MiG-29, which India has in its fleet. In 2010, Russia, possibly under pressure from India, asked China not to export the JF-17 aircraft to Pakistan saying “third country export of its products was unacceptable”. Russia’s own industry was not too keen as China intended to compete with their aircraft MiG-29 in contracts in African and East-Asian countries. In 2010, Russian companies MiG and Sukhoi demanded from the export wing Rosoboronexport to stop deliveries of the RD-93 engines to China. Indian agencies say China and Pakistan are headed to sign contract with Ukraine for supply of fighter jets engines. A Bench comprising Justices RM Lodha and HL Gokhale was hearing a case relating to the killing of two Indian fishermen by Italian mariners off the Kerala coast on February 15. Describing the compromise as illegal and astonishing, the Bench said it was perturbed by the agreement reached before the Lok Adalat and asked senior counsel Gopal Subramanium, who argued for Kerala, as to why the state government had not challenged it so far. Under the agreement, the victims have agreed not to be a party in any of the cases relating to the incident in any of the courts, including the SC, despite the fact that the apex court had issued a notice to them on a petition from the ship owners seeking release of the vessel, Enrica Lexie. “How can courts recognise such a compromise? It is astonishing. It is void under the civil procedure code,” the Bench noted. Senior counsel KK Venugopal, appearing for the ship owners, said his clients were not aware of the compromise. But the Bench was not convinced. The Bench issued a notice to the Italian government, seeking its response to a petition for the vessel’s release. The need for this measure was felt as the CAPFs are in the process of being upgraded and expanded. In addition to standardising technology across CAPF organisations, the IT road map aims at providing an interface between law-enforcement organisations for agility and flexibility in operations and decision making, states a background paper circulated to the CAPFs. The networks so envisioned under the road map will provide the MHA with a tool for procurement, resourcing and rationalisation, outsourcing and shared services. The MHA controls seven CAPFs with a combined strength of about 9 lakh that include the Central Reserve Police Force (CRPF), Border Security Force (BSF), Central Industrial Security Force (CISF), Indo-Tibetan Border Police (ITBP) and the National Security Guards (NSG). These forces are responsible for guarding the border, internal security and counter-insurgency operations, assisting state police forces and undertaking specialised anti-terrorist and disaster-management tasks and are deployed across vast geographical zones. To cater to the changed security environment and increasing threat from terrorists, radical elements, naxals and cross-border smugglers, the strength of these forces is being increased and they are getting better combat and surveillance equipment. Most Central Armed Police Forces are already using IT for basic office administration and some organisations like CRPF and BSF are developing an internal IT-based communication network. However, most of the IT initiatives have been ad hoc and have remained piecemeal IT initiatives started largely as individual-driven programmes or as a response to government directives with a minimal alignment to the organisational transformational goals, the paper states. Even in the Central Reserve Police Force and BSF, which have been in the process of implementing IT applications for over a decade, the process of integrating its organisation-wide functions is yet to be realised for successfully leveraging IT for its strategic and operational needs, the paper adds. Some of the objectives that the road map aims to redress include resources scheduling for manpower deployment and information for quick redeployment of forces, sharing real-time information across Central Armed Police Forces and also with state police forces, common procurement of resources for effective realisation of economies of scales, development of common data models, interoperability standards and resources monitoring at a national level. The NGOs have called for a three day-night road blockade throughout the state including the capital Shillong to press for their demand for review of the electoral roll to purge it of ‘doubtful’ voters. The Khasi Students’ Union (KSU), Federation of Khasi-Jaintia and Garo People (FKJGP) and Hynnewtrap National Youth Front (HNYF) have launched an agitation which has already turned violent in the form of arson of government vehicles, offices and hurling of petrol bombs in various localities of Shillong. The NGOs’ meeting with state Home Minister HDR Lyngdoh, Election Minister JA Lyngdoh and other government officials was inconclusive. An official source said that throughout the course of the meeting, the NGOs remained firm on their demand that the voters facilitation centres opened at the offices of Deputy Commissioners and sub-divisional officers must be shut down immediately and fresh enrolment should be conducted. “We have asked the government to put on hold the enrolment drive through the special cells at the offices of the DC and at the subdivisions,” KSU chief Daniel Khyriem said. FKJGP working president Joe Marwein wanted the Election Commission of India to exempt Meghalaya from the provision of setting up of special counters for the enrolment process of voters. Army Chief Gen VK Singh today said the land in south Mumbai on which the scam-tainted Adarsh Cooperative Housing Society stands belonged to the Army. He also said the judicial commission, which has drawn a contrary conclusion, was not "a court". "Commission ko koi manyata nahi hai (The commission has no standing)...That had been appointed by the state, for its own information. So, we need not take its finding seriously," he said. "Orders to demolish the structure (building) have already been given...now the onus is on you (media) to ensure that the building is demolished," Gen Singh said during an interaction with the reporters after a book release function here. "The judicial commission has also said that it was not giving a judgment, it was merely a fact-finding report.